You love your dog unconditionally—he’s the furriest member of your family, after all. However, when you bring home a new little (different) bundle of joy, the transition from receiving mom and dad’s unwavering attention, to now being an older sibling, can create a bit of confusion in your pup. Never fear, though! We have a few tips to ease the transition and some things you can do to still give your pup the attention he deserves. Bringing home a new baby will undoubtedly change your dog’s environment. 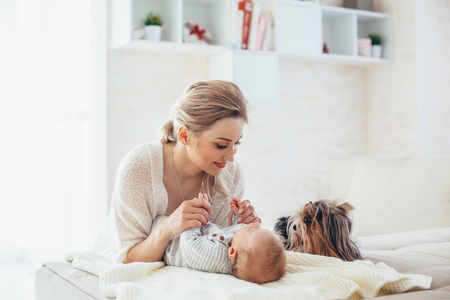 Your dog’s routine switches to revolve around the baby’s needs, so making gradual changes in the time leading up to when you bring the baby home will help him more easily adjust to the transition. If you plan to keep your dog in a new room when you bring home the baby, start introducing him to that designated space in advance. Let him see you practice your baby’s routine, such as changing and feeding. If you include your pup in most of your daily activities, he’ll feel like he’s still a part of the family, which he is, of course! One great activity to do as a new family is to share walks together. As you push your baby in the stroller, allow your dog to tag along so you all have a chance to get out of the house and spend some time together. Daily walks help your dog relax, exercise, and take a break from his changed home environment. This gives your pup a daily activity to look forward to that he can share with his mom and new roommate. Newborns need plenty of attention and care, and the special moments you once shared with your pup easily slip away if you do not intentionally make time for him. Make a conscious effort to give your furry friend some cuddles and words of affection throughout the day. Take time when your baby is napping or playing to spend some time with your dog. Just try to include your pup in as much as possible throughout your daily activities. Creating a low-stress and completely loving environment is important to us here at Silver Streak Kennels, where we offer long-term pet boarding and dog retirement services with plenty of affection and love.